I know what you are thinking, and NO it’s not the permanent or final version… I’ve always liked working with full-scale models, templates, and mock-ups. While CAD (cardboard aided design) is often my first go-to, plywood is even better when something structural is needed. I really wanted to start figuring out what I needed to do to create a custom adapter plate between the Mercedes bell-housing and the Chevy S-10 Borg-Warner T5 manual transmission. The natural answer was simply to make one from affordable and easy to work with materials. 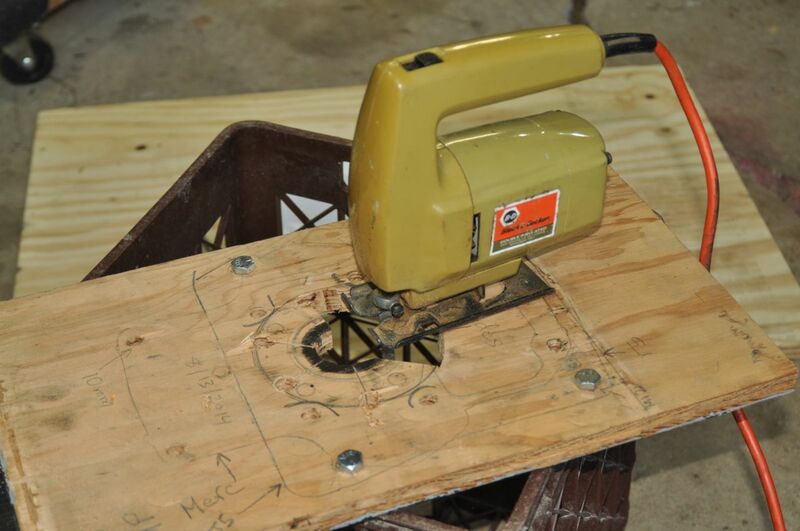 Thus, I started making the plywood version of the transmission adapter plate. According to the measurements I already took, a 1/2″ adapter plate would be perfect for connecting the bell and the transmission. I had some scrap 5/8″ plywood handy, and thought I’d try that for my mock-up. Next, I set the Mercedes bell-housing on the plywood and outlined it in pencil. I then marked the 6 holes and traced the inside as well. 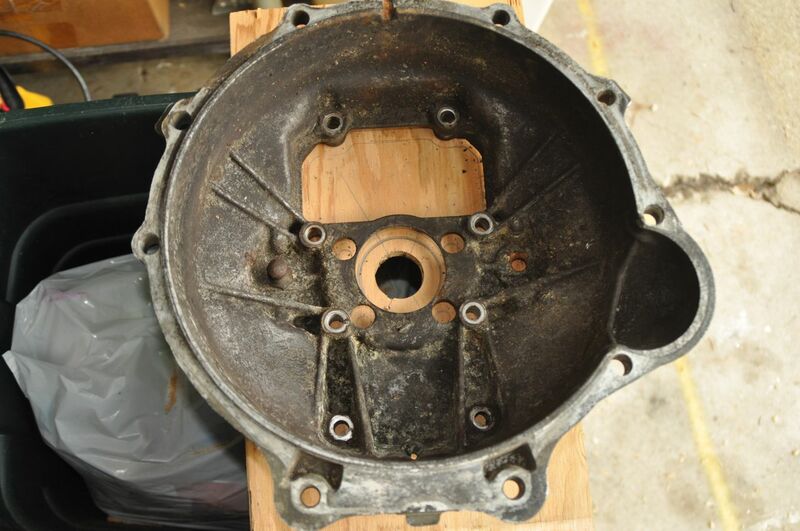 I was a bit concerned trying to next trace the transmission onto the plywood, until I realized I could simply trace the S-10 bell-housing instead, as that was the same size and shape as the transmission, although considerably lighter weight. With both components outlined and holes marked on the plywood, I drilled all the holes. I usually have plenty of 3/8″ bolts around, so I would use those instead of the exact correct metric bolts. The plywood still wouldn’t fit right on the transmission because of the the raised area in the middle. I’d have to use the jig-saw to cut a circle out of the plywood to fit flush. 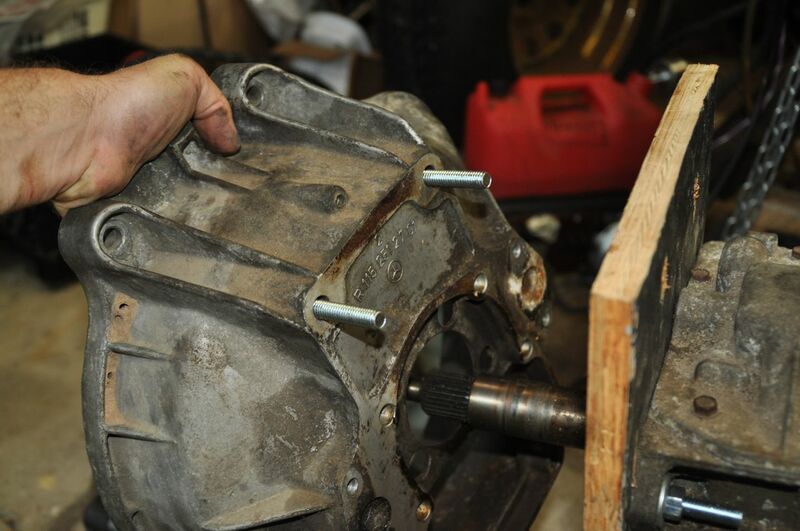 Once that was done, I was able to place the plywood plate onto the transmission and run four bolts through it. Now here’s where a full-size mock-up starts really coming in handy. By dealing with actual physical materials, it’s easy to see how they interfere with each other. For example, The heads of the bolts that hold the plate to the transmission do NOT allow the bell-housing to sit flush to the plywood. So, all I did was use the impact wrench to drive the bolt head all the way in to the plywood. For the final version, I’ll have to use flat-head bolts and counter-sink the aluminum plate. Of course when I went to put the bell-housing on to the plywood I now ran into the fact that only two of the eight bolts would go straight through the plywood for easy mounting. The other four would all end up poking into the transmission. I’ll have to figure out this jig-saw puzzle of bolt direction and installation order before working on the actual metal transmission plate. At least for the moment, even two bolts holding the bell on would be fine. I brought the transmission over to the engine and got three bolts ready to connect the bell to the engine. It only took two attempts to get the transmission up into place with the end of the driven shaft getting straight in to the crank-shaft. (At least I didn’t have a pilot bearing to find…..yet.) Holding the transmission with one hand, I quickly inserted and threaded three bolts from the bell to the engine. Letting go, I took a step back, amazed that the whole thing didn’t fall apart. At the same time, I was struck with a sense of progress. This project has been kicking around in my head for years now. It’s really WAY outside my comfort zone in terms of skills and abilities. And yet, here I was staring at a diesel drive-line I had put together. 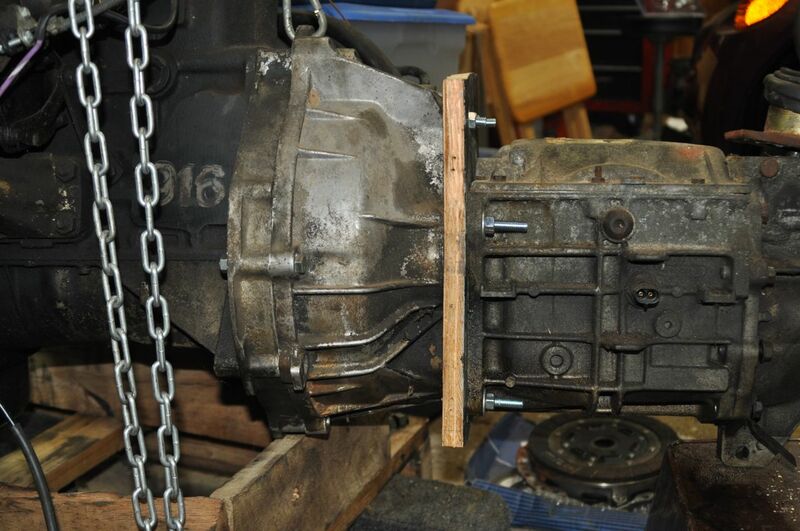 I could easily imagine the electric motor and driveshaft coming off the back of the transmission. I grabbed the shifter and put it through the gears, “vroom vroom vroom” humming in my head like a boy with a MatchBox Car. Finally, I feel like I literally have a handle on the situation. The shifter is the one part of the driveline that you ACTUALLY touch, that isn’t hidden away under the hood and behind a firewall. As I stood in the garage, with the guts of a project hanging on a chain hoist, I realized it might just be plywood, but that mock-up adapter plate proves that I really can get this all together. ‘Til next time, stay charged up! Inside view of the bell. Only the top two bolts are in for now. The project is literally coming together. Ben, this is so awesome to see…I’ve been following your project and just wanted to say congratulations! I wish I lived closer to help, but I’ll live vicariously through your site. Excellent and practical approach .